Home/Uncategorized/Can I get a Business Loan Without Collateral? So, you have a great idea, a fantastic service or an amazing product that you could turn into income. You’ve also found the drive to make it work and a customer base just waiting to buy your product. And now you’re ready for the next step – turning your product or service into a bona fide business, or expanding the business you already have. If you’re like many people who reach the point of turning their ideas and passions into a business, chances are you’ve hit a wall on how to finance the startup or expansion. Of course, bank loans are always an option, and for those whose finances or cash flow allows, that option is certainly an advantage. But with resources, cash flow, working capital and investment needs often extremely tight within many small businesses, the reality that a business owner simply doesn’t have the collateral on the business or personal level to obtain a loan often hits hard. 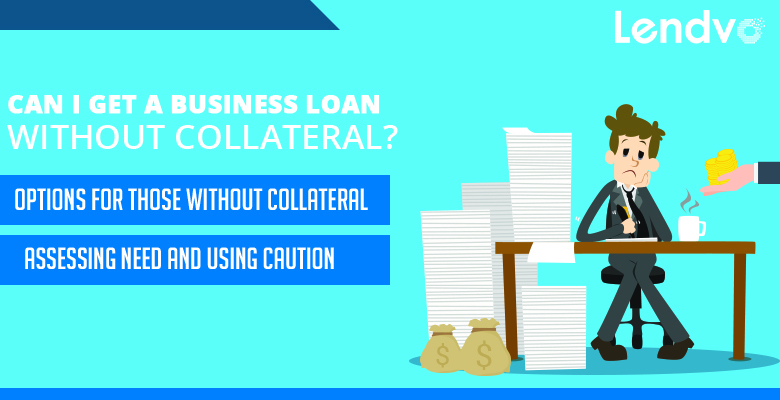 When faced with the growth needs of their business, inevitably the question will be asked, “Can I get a business loan without collateral”? The answer to that question isn’t a simple yes or no. It is a yes or no based on careful consideration of available options and equally based on what an owner can take on in terms of risk. The Small Business Administration isn’t a direct lender but does guarantee that those who do lend you money will get at least a portion back if your company fails and you default. It can result in more paperwork and more time but assuming a potential borrower meets the additional criteria an SGA backed loan can often be found with more favorable terms than if you didn’t use the SBA. o Even though the rate for an unsecured loan isn’t as high as it would be without the backing of the SBA, a business owner may still find the interest and payments unsustainable. o Despite the likelihood of being able to acquire an unsecured loan you will still have to put down 20-30% toward the cost of the startup or business purchase. Many business owners who are seeking an unsecured loan would not necessarily have done so had they had assets or cash in those amounts. o If an owner has personal property of some value and that property has 20% equity or greater the SBA may require you to use this as part of the loan terms. This means that if you owned a house and had 20% equity built up you could be required to put the equity of the home up as collateral. There are generally two types of private lenders to turn to for unsecured loans – direct lenders and peer to peer lenders. Direct lenders can offer the loans based on their company capital. These loans will often have looser requirements than a bank and possibly faster disbursement of funds as well as other advantages. The second type are peer to peer loans. These are like direct lenders in that they are private loans and not bank loans, but peer to peer lenders use a pool of investors to fund your loan. Many private direct lenders are online and are essentially a line of credit up to around $250,000 (depending on the lender) that can be utilized for any business need. Determination of eligibility is based on the assessed health of the applicant’s business and not their personal credit. Funds can usually be obtained in a few business days and terms for repayment are can vary from weekly to monthly, also depending on the lender. This is a good option for those requiring short term infusions of cash to accomplish specific business needs. There are other private peer to peer lenders called “Lending Marketplaces”. These marketplaces may offer a wide range of small business loan products including SBA approved loans, short term lines of credit and short and medium term financing as well as specific options such as equipment financing and franchise finance options. They don’t usually offer startup loans, but depending on which type of loan you are applying for they may offer certain products unsecured and without collateral. o Faster disbursement of funds. o Looser requirements than banks. o Loans, even unsecured non-collateral loans, are approved for funding by a pool of investors who may be willing to take larger risks depending on their assessment of the business need. o Higher interest rates than banks or loans obtained through the backing of just the SBA. If your business is small enough you may qualify for a microloan. Microloans are sourced for as little as $500 up to around $50,000 for businesses that only need small amounts of cash to operate or expand. Often used for businesses requiring little startup or operating capital, these loans generally have low interest and are often operated by non-profit companies to foster new business growth in a community or region. Many microloan programs are geared toward minorities, women owned businesses, veterans and low income individuals who want to enter the arena of business ownership. o Almost anyone can qualify. o Loan amounts are limited in size and you may need more than a microloan can offer depending on your business. This option is often a last resort as they carry a heavy cost in relation to risk. However, in many cases you may find it easier to use a credit card or an unsecured line of credit to pay for business needs in the short term. These loans and cards are most often obtained by leveraging the credit rating of the owner and as such can affect his or her personal credit capability outside of the business. o Flexible as to how the money can be used. o Leverages the personal credit rating of the owner to obtain. This has the double risk of affecting the owners credit capacity outside the business as well as future borrowing within the business if it too is tied to the owner’s credit. o Very high interest rates. o Payment terms are set by the lender and have little or no flexibility. Each of the products above carry different amounts of risk and expense. While none of the options for a non-collateral loan are as affordable as a secured loan, there are many that could provide funds for your business when traditional lending is not available and the funds are necessary to move your business to the next level or get it off the ground. Each owner must evaluate their personal credit, business health and cash flow before applying for any of these loans without collateral. If the assessed risk is within the business’ capacity to repay the loan, then there are avenues available for a non-collateral loan. If that risk is beyond that business’ capacity to repay the loan then other considerations, often simple patience and diligence, are required to bring a potential borrower’s financial position in line to qualify for an unsecured no collateral loan.